Semolina is a coarse, yellow flour that people might confuse with cornmeal. Despite its yellow color, semolina does not come from corn — it’s traditionally made from the endosperm of durum wheat. Consequently, semolina is not gluten-free. It is actually a product that is particularly high in gluten. Semolina flour is made from durum wheat, and is therefore not gluten-free but high in gluten. What Foods Have Semolina Flour? Semolina flour is known for its coarseness, but it is available in a variety of fine and coarse textures. 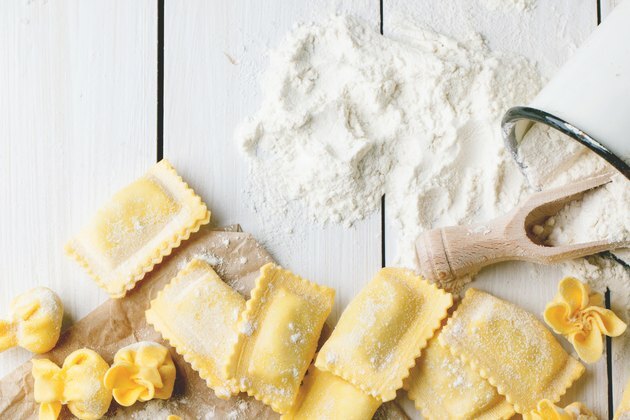 The size of semolina particles has a distinct effect on foods — for instance, it can affect the elasticity of foods like pasta or the ultimate color of a dish. Thanks to these qualities, semolina is used in a variety of different foods, including in traditional Italian, Indian and Middle Eastern cuisine. You’ll frequently find it in pastries, pastas and pizzas. Semolina is also the primary ingredient used to make couscous. It can even be used to give certain foods a nice crispy texture — you can use it to crust even the softest foods, like aubergine, paneer or squid. You may find semolina in soups or stews, because it can be used as a thickening agent. Because durum wheat is semolina’s source, this product is not suitable for people who need to follow a gluten-free diet. If you’re looking for flour like semolina, but a gluten-free version, there are quite a few alternatives available. However, these alternatives will differ based on what you’re cooking. There are also products called semolina flour made from gluten-free products like rice and corn (known as rice semolina and cornmeal semolina). However, these are not the same or similar to traditional semolina — if anything, their names are simply a reference to the textural similarities of these products. Amaranth flour: This seed-based flour is filled with nutrients. It has 10 to 24 percent more protein than semolina flour and 15 to 30 percent more fiber. It ends up softer than semolina flour when cooked, so you may prefer to use amaranth flour as a thickening agent, instead of in bread or pasta. Buckwheat flour: This protein-rich, gluten-free flour is one of the most common alternatives to semolina flour. It can be used in pancakes, pasta and all sorts of baked goods. It’s cooking properties are most similar to traditional flour, but you may not like its dark color. However, this can be easily altered by mixing in a bit of amaranth or rice flour. Garbanzo flour: Otherwise known as chickpea flour or gram flour, garbanzo flour is a great alternative to semolina flour. It’s particularly well suited to many dishes from Indian cuisines. Rice flour: Ground raw rice is used to make rice noodles in many Asian cuisines. Although the flavor is quite distinct from traditional flour, it has a light texture that makes it well-suited for noodles and baked goods. Potato starch flour: This can be used as a thickening agent, combined with other gluten-free alternatives and used to make foods crispy. Unlike other gluten-free alternatives, it doesn’t have a particularly distinct taste, so you can use it liberally. There are a wide range of other gluten-free alternatives to semolina flour available, including arrowroot, millet, oat flour, sorghum flour and tapioca starch. The easiest way to find a suitable alternative for your cooking needs is to understand what the ingredient is being used for in a dish. From there, you can easily find a gluten-free alternative based your specific needs.